Our favorite maker projects from July 2017. The worldwide maker community has become so large that it can be hard to keep up with. In the past 10 years, the number of makerspaces worldwide has increased by 1,400 percent. That doesn't take into account the number of makers who comprise online communities like ours. A lot of awesome creations go unnoticed because they are posted on websites like imgur, which has a very broad scope of topics. I thought it would be fun to highlight some maker projects that you might have missed. Here are some of my favorites so far from July! This project doesn't have much electronics to it, in fact, the only electronic part of it is a micro USB cable. But my inner fanboy just can't resist a good Game of Thrones-themed project! 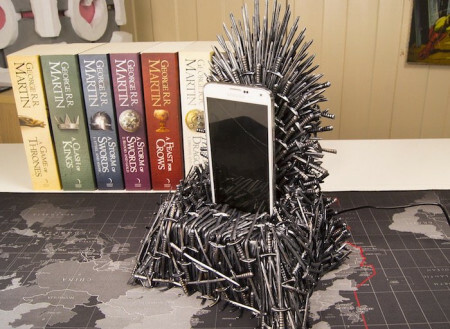 This iron throne for your smart phone was made by the user NaturalNerdy, who has made some awesome projects with precision wood cutting and LEDs. She also has a Youtube channel called Natural Nerd. The iron phone charger was comprised mostly of tiny plastic cocktail swords. The swords were glued to a wooden cutout in a throne shape with some foam edges to get the shape right. A micro USB cable is run through a corner at the bottom of the back end and the part that connects with the phone sits upright on the seat. The swords were super glued to the throne, spray painted, and then hand painted over to look metallic. You can view her tutorial video below, and be sure to check out her website Natural-Nerd.com! James Hobson, the Hacksmith is always almost getting himself blown up, and his 4th of July Arduino creation is no exception! The "BOOM" BOX! is a little box with an old timey T handle like something Wil E Coyote would use. The "BOOM" BOX! is a two piece controller, a transmitter, and receiver for lighting fireworks remotely that are controlled by two Arduino Nanos. When you push the little handle down, the receiver picks up the signal and lights an electric match, which in turn lights the fireworks. It's a pretty simple circuit, so you can recreate it for pretty cheap. You can find a tutorial to make your own on Maker.io. We have a done a few automated door lock tutorials on DIY Hacking in the past few months, but this one really caught my eye. This one was made by Elliot Nauert, a student at the University of North Carolina Ashville. His automated door lock design is especially neat because you can transfer it to different doors, which is great for people who are renting and don't want to make any permanent modifications to their house or apartment. It uses a stepper motor to turn a gear that turns another gear surrounding a deadbolt. The stepper motor is controlled by a board that I'm still trying to identify and receives a signal from some variation of an ESP8266. You can find a full photo spread of his project on imgur and see a demonstration of his project in the video below. Are there any maker creations from July that caught your eye? Feel free to share them in the comments! Also, if you have a creation that you'd like to show off, submit your tutorial to Maker Pro! I like to dink around with Raspberry Pis. I also make video games and have a cute cat.